RapidPure Pioneer Straw water purifier 1.2L/min - 7000 gallon life!! Finally, an alternative to slow cheek puckering water filters is now available! Our new RapidPure water filter straw is based on the new UltraCeram filter media technology that can remove 99.9999% micro-organism (such as viruses, bacteria & protozoa which can include Cryptosporidium, Guardia Intestinals, Legionella, Pseudomonas, Salmonella, E-coli, Mycobacteria, Aspergillus), Endotoxins & DNA – all at flow rates hundreds of times greater than standard ceramic water filter elements. This is our smallest and most compact filter option the RapidPure Pioneer Filter Straw which has a 1.2 Liter per minute flow rate using a 2.5" UltraCeram filter element that can filter more water in an hour compared to what some ceramic based filters can do in a whole day and still assure the water is clean, pure and safe to drink. If you have ever had a city boil order issued because e.coli or some other bio hazard was found in your culinary drinking water and thinking you were prepared pulled out your ceramic based gravity drip water system to protect you and your family from the harmful bio containment only to find that after filling up the container with the essential water you needed to purify immediately found instead that the slow drip drip drip of the water flowing through the ceramic filter was not enough to satisfy any real need and it actually took upwards of 24 hours to give you even a few gallons of usable water and the first gallon of that had to be poured down the drain because it was filled with black charcoal from the activated carbon hidden inside the filter. 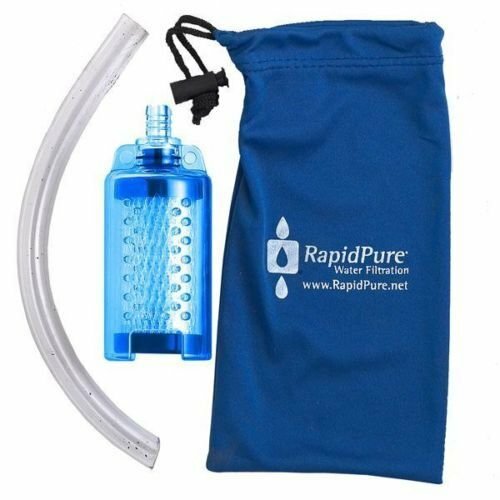 Rapid Pure's Pioneer filter straw is a great choice for fast and light backcountry enthusiasts and emergency use, with a replaceable filter that reduces and removes 99.9% of bacteria and viruses without chemicals.